What Are The Best Rolling Stones Live And Studio Albums? This page has readers polls to find the best Rolling Stones live albums and the best Rolling Stones studio albums. What Are The Best Live Albums By The Rolling Stones? The Rolling Stones are a great live band but which is the best Rolling Stones live album? The critics say Get Yer Ya Ya’s Out but do you agree? I’ve put together this poll for you to have your vote. In fact you can vote for the three best since Ya Ya’s is a great album, even if I prefer The Brussels Affair. Top at the moment is the brilliant Brussels Affair from 1973 with Mick Taylor”s surging guitar. This has been a famous bootleg but for a period, an approved version was available from the Stone”s own website. What makes it so good? A short but well selected setlist pulling songs from Let It Bleed, Sticky Fingers and Exile on Main Street and a terrific performance. 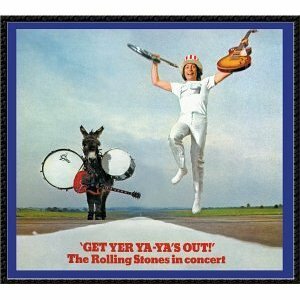 A close second is their best known live album, Get Yer Ya-Ya”s Out from 1969. Again this is with Mick Taylor but this time, he’s very much the new boy and his playing is tentative when compared with The Brussels Affair. It is mainly focused on the Beggar”s Banquet and Let It Bleed although the extended version has more songs from the Stones plus support sets from BB King and Ike and Tina Turner. The poll clearly shows that these are the two must have live albums by the band. Below them are plenty of live albums with Ron Wood on guitar and several feature their first lead guitarist Brian Jones. In 2015 we saw some more Mick Taylor era live recordings released with a legal version of Get Yer Leeds Lungs Out from 1971 with the super deluxe version of Sticky Fingers. It will take time for this to move up the poll. It’s a shame this hasn’t received a separate release since it’s an expensive way to get the live concert recording. My issue with it, that stops it being essential is that the setlist hasn’t moved on much since Ya-Ya’s. In third place at the moment is the 1978 DVD called Some Girls Live In Texas. Several other mid 1970s albums are also getting considerable support – Love You Live from 1975 to 1977 and the more recently released LA Friday/LA Forum from 1975. Also getting significant support is their unplugged album, Stripped from 1995. What Are The Best Studio Albums By The Rolling Stones? I believe the best live albums are closely linked in time to the best studio albums. That’s one of the reasons why I think some bands haven’t delivered an exceptional live album when they could have. What Are The Two Best Rolling Stones Studio Albums? The results are fairly predictable in terms of the top 3 with Sticky Fingers, Exile On Main St and Let It Bleed dominating the poll. Some way behind are Beggars Banquet and Some Girls in fourth and fifth places. 1968 to 1978 was a golden decade for the band. The Brussels Affair is a great example of how everything comes together at the right time. The Rolling Stones had created three of the greatest rock albums ever made with Let It Bleed, Sticky Fingers and Exile On Main Street and Mick Taylor had matured into an exceptional guitar player with the confidence to show his talent. What Do You Think Of The Results Of The Best Rolling Stones Album Polls? I’m not planning to close this poll so it will keep accumulating votes but what do you think of the results so far? What albums did you pick and why? What period live album would you like to see now that they’ve started to release official Stones bootlegs. Please help me to find the best live albums by voting in more of the readers polls. The Stones are mainly a blues rock band although they play with an R&B bias. It’s not a surprise that Ya-Ya’s is doing very well. This time The Brussels Affair is further down the results. This entry was posted in Best Live Album Polls and tagged The Rolling Stones Live Albums by Paul Simister. Bookmark the permalink.